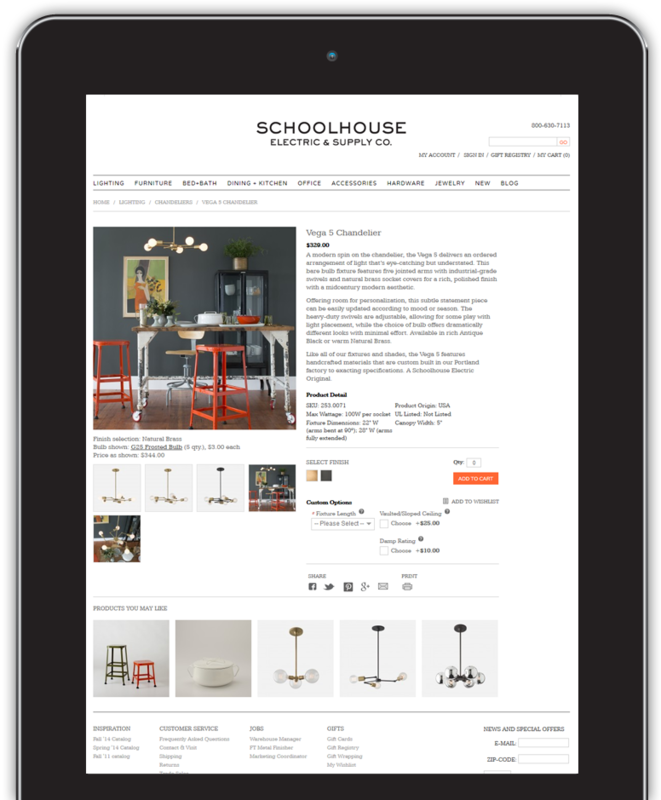 Schoolhouse Electric is a Portland-based manufacturer of iconic lighting, furnishings and tools for productive living; classic period, vintage and contemporary light fixtures and glass shades, home accessories, furniture and hardware. They make many of their products in houses; for the spaces we live in, not based on time or trend, staying true to the brand. Schoolhouse Electric came to us for a maintenance-based agreement to fix and enhance their website for increased usability, design tweaks and more product visibility. It is a rather simple website with straightforward functionality and interface. Most of our work revolves around backend functionality to enhance customer experience and lifetime value. 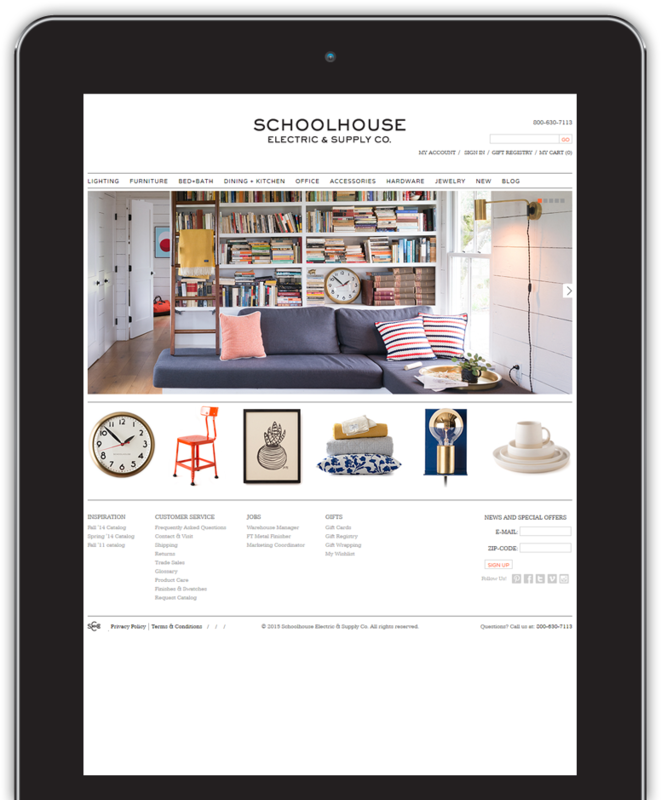 Schoolhouse Electric came to us with an already established Magento Enterprise website. We initially assessed the website for design and user-interface issues and bad coding practices and they are slowly being resolved based on a scheduled support assignment. The work we are doing on the website is based on their specific request and are scheduled through project planning and resource allocation. Most of the work we are doing for Schoolhouse Electric revolves around backend integration and enhancement of some of Magento Enterprise native capability. Improve design and user-interface by tweaking existing block placements to provide more product catalog visibility. Added a search feature to the native Magento Enterprise Gift Registry functionality that allows customers to search for a first or last name and removed field requirements for more flexibility. Enhanced the native Magento Enterprise Gift Registry functionality to group added items in listed gift registry profiles based on product categories instead of just grouping them up in one table. 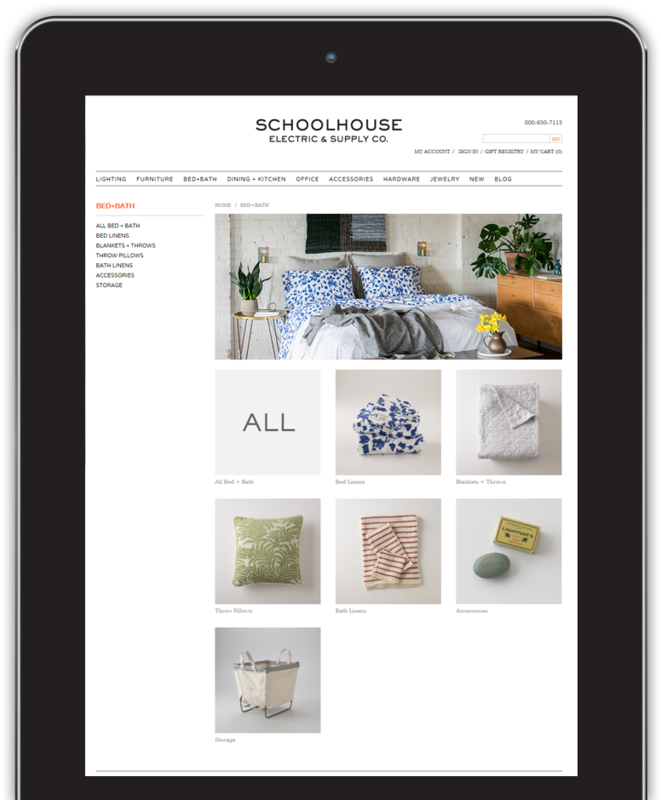 We integrated a powerful email marketing tool for Schoolhouse Electric for product promotions and increased profitability. The eCommerce platform that is second-to-none in the industry in terms of performance, scalability and flexibility. Integrated job distribution and social recruiting software. Listrak is the leader in retail email marketing services with groundbreaking innovation and an unrivaled software tool. Freemium web analytics service offered by Google that tracks and reports website traffic. World's largest dedicated security technology company that delivers proactive and proven solutions and services.